Beijing is preparing the public for the coming storm. The first round of U.S. tariffs and Chinese counter-tariffs came into effect on Friday. All told, they will directly affect some $68 billion in goods. On July 15, the U.S. is expected to impose more tariffs targeting $16 billion in Chinese goods, with proportional Chinese retaliatory measures to follow. Things are likely to escalate from there. Whether or not this spat should be defined as a full-blown trade war, both sides are now firing with live ammunition, and neither side will escape unscathed. In some ways, it’s not an equal fight. 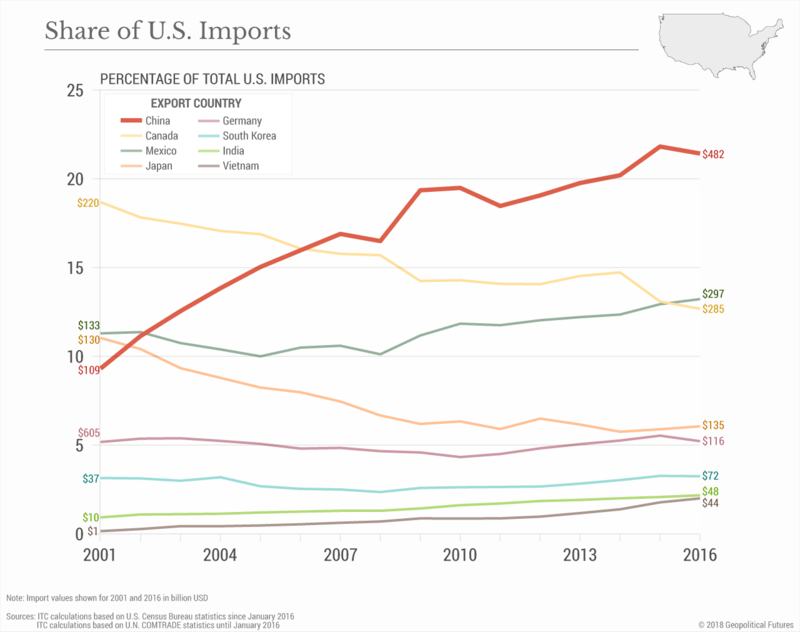 China is more dependent on U.S. exports than the U.S. is dependent on Chinese imports, and the Chinese economy is far more fragile than that of the U.S., so it’s reasonable to conclude that the United States is heading to battle from a position of strength. Still, it’s not just about who can punch the hardest on the economic front, but also about who can take the most hits without facing major political blowback at home. And here, China’s ability to direct state support to targeted industries, crack down on dissent and shape public perceptions gives it some advantages, especially against a divided adversary heading into an election season. Earlier this week, we got an inside look into how China is attempting to use its media controls to steel public resolve for the hits to come. The China Digital Times, a U.S.-based censorship-monitoring site, published what it claims is a leaked circular from Chinese authorities outlining how state media should cover the trade spat. We cannot confirm the document’s authenticity, but its contents jibe with narratives Chinese state media has begun pushing – and hint at intensifying pressures that Beijing is most certainly feeling. Below we provide some excerpts from the allegedly leaked document and outline how these statements can be used to shape public discourse on trade. The theme of “us against the world” has been central to sustaining public support on any front where Beijing’s moves have triggered an international backlash, from human rights crackdowns at home to assertiveness in the South China Sea. And it’s a potent one. It reflects a historical effort to perpetuate and harness the power of China’s defining narrative since its defeat in the First Opium War in 1842: that China was bullied, carved up and subjugated by foreign imperialists during the so-called Century of Humiliation, subjecting what was once the world’s pre-eminent civilization to untold suffering. And if the Chinese people fail to unite behind their leaders, according to this narrative, outside powers would readily do it again. Chinese leaders have been adept at nursing collective grievances as part of the never-ending quest for national rejuvenation since even before the Communist Party took power in 1949. But it’s not just propaganda. Rather, it speaks to an enduring anxiety embedded deep in the national psyche that, despite China’s more recent gains and burgeoning national confidence, it could all come undone yet again. China thinks the trade fight won’t be over quickly. This is, in part, because it’s unclear what the White House would need to claim victory and move on. If the fight were just about the trade deficit, this wouldn’t necessarily be the case. In trade negotiations, China reportedly offered to buy between $25 billion and $70 billion more in U.S. stuff (mostly energy and agricultural goods) annually to bring the deficit down somewhat. And as the Chinese consumer market grows, it’s likely to be buying more and more U.S. goods in the coming years anyway. Already, China is the fourth-largest market for U.S. exports, with China-bound goods growing some 115 percent over the past decade to nearly $130 billion each year. But the real fight is over China’s quest to become a dominant technological power – and the mercantilist policies it’s using to leapfrog the U.S. and other Western powers in the high-tech realm. Here, it cannot back down without undermining its core national strategy. Its reliance on low-cost manufacturing has left it vulnerable to rising competition from its lower-cost neighbors, productivity declines as its workforce ages, and downturns in Western economies – as was exposed following the global financial crisis beginning in 2008, when Chinese exports contracted sharply. If anything, the U.S. moves to squeeze it on this front will only reinforce the belief in Beijing that it must become less reliant on foreign technology by whatever means necessary. But the U.S. is loath to back down as well. Its comparative advantage over lower-cost manufacturers like China is in high-tech goods and services. And the real Chinese threat to long-term U.S. economic competitiveness and strategic interests is that China eats into this advantage. “Made in China 2025” is China’s contentious plan to become a leader in the industries likely to matter most over the coming century (for both commercial and military applications), such as semiconductors, robotics, aerospace, green energy and biotech. It was conceived as a rallying cry at home, a roadmap for how the Communist Party would fulfill its pledge to make China a world-class power. But Beijing now sees the slogan as giving the U.S. a fixed target with which to galvanize support for President Donald Trump’s tariffs and shift focus from the trade deficit to the technological threat. The trade war is divisive, and Trump doesn’t have much support on either side of the aisle or with allies for tariffs intended to revive U.S. steel and aluminum industries at the expense of U.S. consumers, industries that rely on cheap Chinese imports and industries likely to be harmed by Chinese retaliatory measures. But there’s broad agreement among both parties and abroad that China’s mercantilist tech policies are a threat (even if there are major disagreements in the U.S. over Trump’s plan to address them). To curry support from Trump opponents in the U.S. and abroad, Beijing is trying to portray itself as a champion of free trade fighting back against a president hellbent on dismantling a system that made much of the world rich, however disingenuous this portrayal may be. In other words, Beijing is trying to change the subject. Relentlessly touting a high-profile plan that involves practices like forcing foreign firms to hand over technology in exchange for the right to operate in China – not to mention activities like outright technological theft – wasn’t helping. China’s best hope is that the trade war becomes politically untenable for Trump, particularly with midterm elections just around the corner. And this means directing countermeasures at politically influential interest groups. According to Brookings, for example, Trump won 82 percent of the counties expected to see job losses from Chinese retaliatory measures. American farmers, who’ve routinely exercised considerable sway on U.S. trade policy, are squarely in Beijing’s crosshairs, with key U.S. crops like soybeans, wheat and corn facing 25 percent tariffs. China has ample options in this regard. According to a study by Oxford Economics, some 2.6 million jobs in the U.S. were created by the combination of U.S. exports of goods and services to China and bilateral foreign investment flows. The same study said cheap Chinese goods such as washing machines and solar panels (both of which were targeted with tariffs in January) have saved the average American household some $850 annually. General Motors sold more than a million more cars in China last year than in the United States. According to the Peterson Institute, some 60 percent of U.S.-bound exports from China were produced by multinational firms, some of them American, rather than Chinese-owned companies. Know thy enemy’s strengths. Don’t rally his base. Keep him focused on trade disputes with Canada, Japan and the European Union. Don’t give him reason to put the spotlight on alleged Chinese human rights violations that speak louder than the president’s words. Beijing’s ability to control media narratives and shape public perception at home is indeed a strength. But its need to do so points to its underlying weaknesses. China is facing an economic reckoning as it enters a prolonged phase of slowing growth, and Beijing is trying desperately to push through ambitious economic reforms before that day comes. Its need to restructure its economy, whittle down a staggering debt load and wrestle pollution into submission, while also maintaining high employment and broad backing for the regime, has it performing a high-wire act. Already, amid Beijing’s crackdown on shadow lending, we’re seeing a growing wave of defaults among private sector firms that had grown fat on limitless credit. Last winter, anti-pollution measures led to widespread natural gas shortages. In May, the coal-rich city of Leiyang failed to make payroll amid revenue shortfalls stemming from Beijing’s crackdowns on high-polluting industries and overcapacity reforms. Growth in exports, retail sales and fixed-asset investment is slowing. So the trade war is coming at a precarious time for China. And in recent weeks, we’ve started to see hints of dissent from influential figures and media outlets asking the question if China can really afford to fight a two-front war against the U.S. on trade and against its own internal woes. Beijing doesn’t exactly have a choice in either matter. Dark clouds are gathering either way; perhaps its only option is to prepare the public for the storm.